Hopefully you all survived the torrential rain that marked this year’s Canada Day and that you managed to have a fun-filled holiday regardless of the weather. Although the official day has come and gone, the rest of the year will continue to be marked by exciting happenings and neat events celebrating our country’s past, present and future. 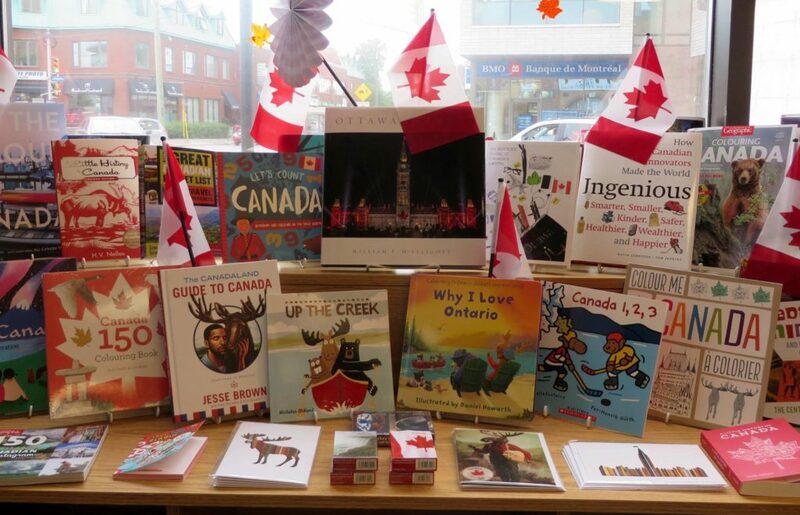 To keep that patriotic glow going or maybe in the quest to learn something about our country that you didn’t know before, check out some of our favourite Canada-themed reads of the year so far: Exploring the Capital by Andrew Waldron; You Might Be From Canada If… by Michael de Adder; I Am Canada by Heather Patterson; The Great Canadian Bucket List by Robin Esrock; Now You Know Canada by Doug Lennox; 25 Places in Canada Every Family Should Visit by Jody Robbins; Canada ABC by Paul Covello; Surviving Canada by Myra Tait; This is That: Travel Guide to Canada by Peter Oldring, Chris Kelly, and Pat Kelly. As we settle ourselves into the slower rhythms of the summer, it’s always a good idea to have a healthy stack of books to hand. That way, when you find yourself suddenly lounging in a hammock in the shade of a mighty oak or reclining with a cold one on the dock by the lake, you’ll have a quiet and willing friend to keep you company. Taylor Jenkins Reid has given us a real treat of a read in a The Seven Husbands of Evelyn Hugo. Following the colourful and intriguing life story of aging and reclusive Hollywood star, Evelyn Hugo, this novel will take you completely out of yourself and transport you to a world full of lights that shine, affairs that simultaneously build and break, and ambitions that must be fed. Hot on the heels of her supremely successful novel, The Little Paris Bookshop, Nina George‘s newest novel, The Little French Bistro, has just hit our shelves and is already proving to be a staff favourite. Full of the same warmth and charm as it’s predecessor, this new story takes readers to Brittany where our protagonist, Marianne, flirts with new life paths and a possible future she could never have imagined. If you enjoyed The Light Between Oceans by M.L. Stedman, keep riding that thematic train and take a chance (and another trip back in time) with The Lightkeeper’s Daughters by Jean E. Pendziwol. When Elizabeth, a resident at The Boreal Retirement Home, discovers her late father’s journals from when he was the lighthouse keeper on Lake Superior, she decides it’s time to delve in to her own family’s past to solve one of the great mysteries of her childhood. The House at the Edge of Night by Catherine Banner is a wonderful family saga that spans almost a century. Set on the enchanting Italian island of Castellamare, readers will be drawn into a world of love stories, family secrets, and tales of sacrifice and revenge, all while being befriended by unforgettable characters and completely mesmerized by the stunning locale. If you want to add a little more grit to your summer, try one of these great new reads: The Force by Don Winslow – a tension-filled stunner of a story full of greed, corruption, and redemption; Be Ready for the Lightning by Grace O’Connell – this novel of psychological suspense is intriguing, fast-paced, and will really make you stop and think; The Party by Robyn Harding – at once shocking and heart-stopping, this intense novel illustrates the best and worst of human nature and what can happen to a family when tragedy strikes; Persons Unknown by Susie Steiner – this second book in the Manon Bradshaw mystery finds our determined detective five months pregnant and thrown into a murder investigation that makes her question how well she knows her own family; The Child by Fiona Barton – a chilling mystery surrounding the discovery of a child-sized skeleton in the foundations of an upper-class London house. Is hitting the open road on your summer agenda this year? If so, start your road trip off right with a detailed study of John Catucci‘s new book You Gotta Go Here! Featuring over 300 hidden gems and hometown favourites from across Canada, the USA, and Europe, with this book as your guide, you will never go hungry when the rubber to the road. Dion Leonard, an Australian ultra marathon runner now living in Edinburgh, Scotland, has just published the most heart-warming dog book of the year to date, hands down! Finding Gobi is his story of crossing paths with Gobi, a stray dog, while running in a 155 mile race through China’s Gobi Desert. As he ran through unforgiving mountains, isolated villages, and punishing dunes, Gobi kept pace with him, raised his spirits, and slowly melting his heart. It’s a lovely story for any dog lover in your life! From the many-faceted, multi-talented author of Once Upon a Time in Russia and The 37th Parallel, comes a brand new and slightly quirky science book perfect for anyone fascinated by DNA, ancient species, or the scientific concepts that inspired Michael Crichton‘s Jurassic Park. Woolly by Ben Mezrich is a dramatic narrative of true events pertaining to the discovery, extraction, and attempted splicing of Woolly Mammoth DNA. Long extinct, but endlessly fascinating, the Woolly Mammoth is a true giant of history. This book is extremely readable and is bound to fascinate scientists and hobbyists alike. A new book can provide hours of entertainment for children of all ages. They’re especially useful when taking family holidays when loving siblings confined in a small space seem more interested in poking at each other than playing a civilized game of “I spy with my little eye.” So, here are a few new titles it might be good to have nearby when the sound of silence is all you want to hear from the kids in the back seat. J.D. Rinehart has just released his newest fantasy adventure novel for children called A Kingdom Rises. As the third book in the Crown of Three Series, this new novel continues the story of triplets Tarlan, Gulph, and Elodie and their quest to fulfill an ancient prophecy in a land rife with magic, danger, and deceit. The previous books in the series are Crown of Three and The Lost Realm. On a much smaller scale, but with no less heart, The Tiny Hero of Ferny Creek Library by Canadian author Linda Bailey is a wonderful, whimsical story of bravery and determination. Eddie is a tiny green bug who lives behind the chalkboard in a fourth grade classroom with his parents, his 53 siblings, and his Aunt Min. When his beloved aunt goes missing on a trip to the library, Eddie sets out to find her and discovers that the substitute librarian is planning on shutting the library for good! Full of bravery and heart, this story of the little bug who loves books is a real winner! Here are a few more recent arrivals that have already wormed their way into our hearts: Polly MacCauley’s Finest Divinest Woolliest Gift of All by Sheree Fitch – a beautifully illustrated story about knitters, weavers, and makers that will delight children and adults alike; Old Hat by Emily Gravett – this adorable story finds Harbert always one step behind the latest fashion trends in hats no matter how hard he tries until, one day, he decides to forgo hats altogether and starts a new trend of his own; The Lines We Cross by Randa Abdel-Fattah – a great YA book about two teens caught up in their parents’ world of judgement and prejudice who need to decide where they’re going to align themselves when the lines get drawn in the sand; Welcome to the Slipstream by Natalka Burian – just when Van starts to get settled into her new life in Las Vegas, she’s forced to pull up roots yet again in order to chase her mother to Arizona in an attempt to save her from joining a sketchy self-help cult. The books just keep pouring in at the store, so keep your eyes peeled for some of these upcoming releases: The Land of Stories: Worlds Collide by Chris Colfer (July 11), Everything All At Once by Bill Nye (July 11), The Lying Game by Ruth Ware (July 25), Truly Madly Guilty by Liane Moriarty (July 25), I Love My Purse by Belle DeMont (July 30), A Nest of Vipers by Andrea Camilleri (August 1), and The Only Cafe by Linden MacIntyre (August 8). Whether they’re playing the role of silent companions, peace makers, summertime teachers, or partners in crime, books are always going to be your safest bet. So, no matter where this summer takes you, be sure to make a trip (or two) to the bookstore to stock up on great reads to carry you through.